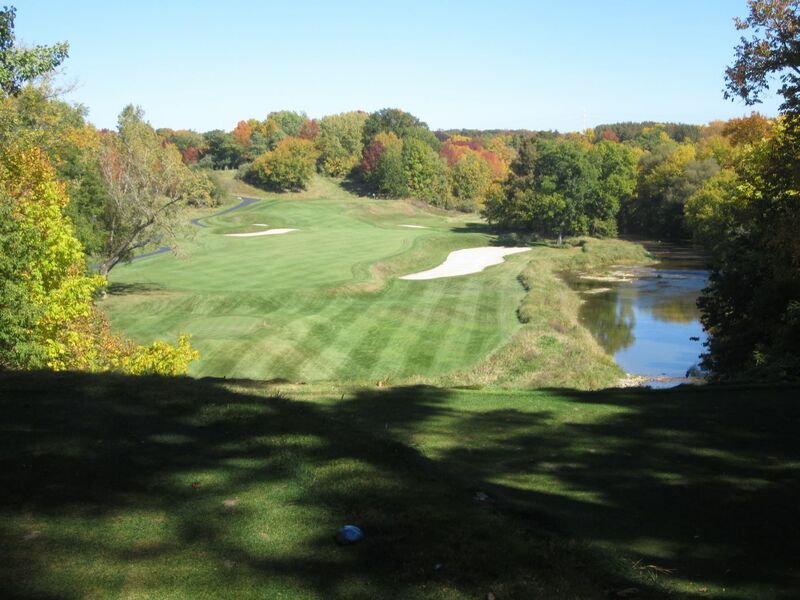 A true Pete Dye masterpiece, the River at Blackwolf Run is unanimously the second rated course in Wisconsin, Golf Magazine’s 11th”Best Course You Can Play,” and GolfWeek’s 47th rated modern course in the United States. 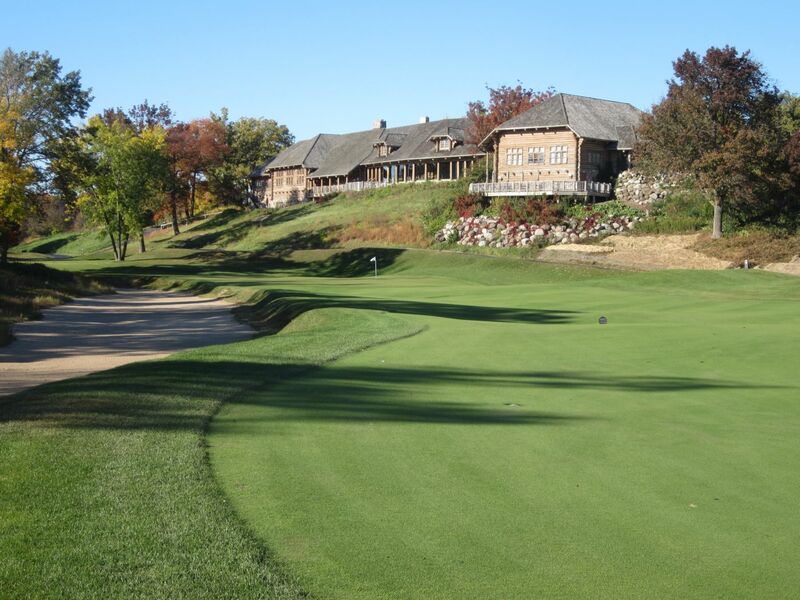 Host to the 1998 and 2012 US Women’s Opens, Blackwolf Run is perhaps best known for the ’98 Open won by Se Ri Pak, whose victory at the Original Championship course (comprised of the original eighteen holes at Blackwolf Run – nine apiece from the River and Meadow Valleys courses) brought women’s golf to a whole new level, and resulted in an insurgence of professional golfers from South Korea and other Asian countries. At the time, Pak was the only South Korean golfer on tour. In 2012, she is one of 45. And television sales to South Korea are the number one source of revenue for the LPGA. A product of the American Club Resort – owned by Kohler Company – and one of only 36 resorts worldwide to be designated both Forbes Five-Star and AAA Five-Diamond, the River features beautifully manicured memorial bentgrass fairways and tees, Kentucky bluegrass and fescue rough, and the same seed of A4 bentgrass found on the greens at Augusta. 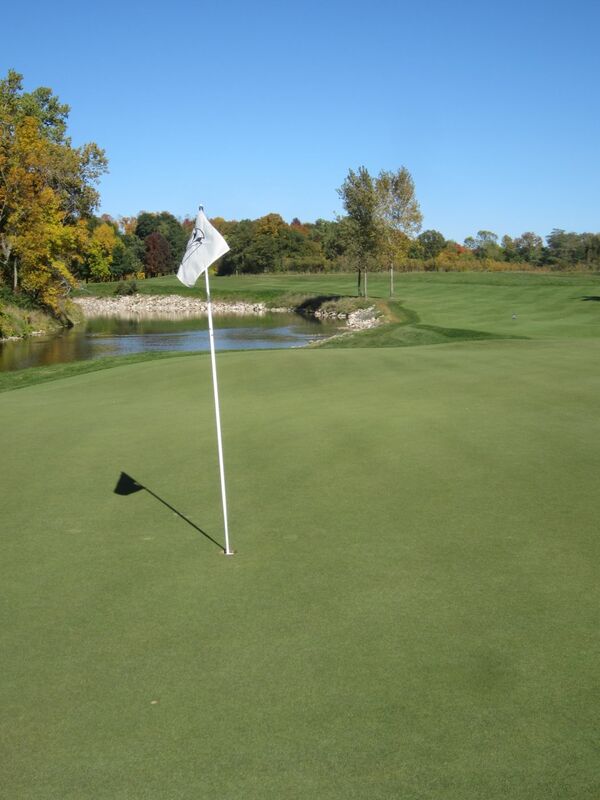 These greens are the most formidable of many challenges facing golfers at the River. Currently rolling at an eleven and a half on the stimp meter, they were sped up to a blistering fourteen for the Women’s Open this past July. Pete Dye’s signature parkland course features not only lightning fast greens, but large and dramatically undulating putting surfaces that roll true but are about as difficult to read as a mid-nineteenth century Dickens novel. There are few subtly breaking putts on the River Course. The slopes are extreme, and putting up and downhill proved to take more touch than I had brought to the course. 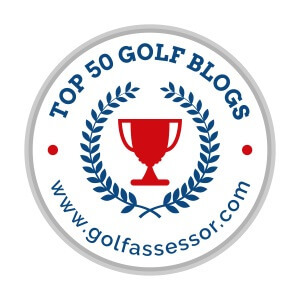 The most disappointing of these situations was on the par five eighth hole – after finding the front of the green in two, I was excited to have a 50-plus-foot uphill putt, only to four-putt it for bogey. 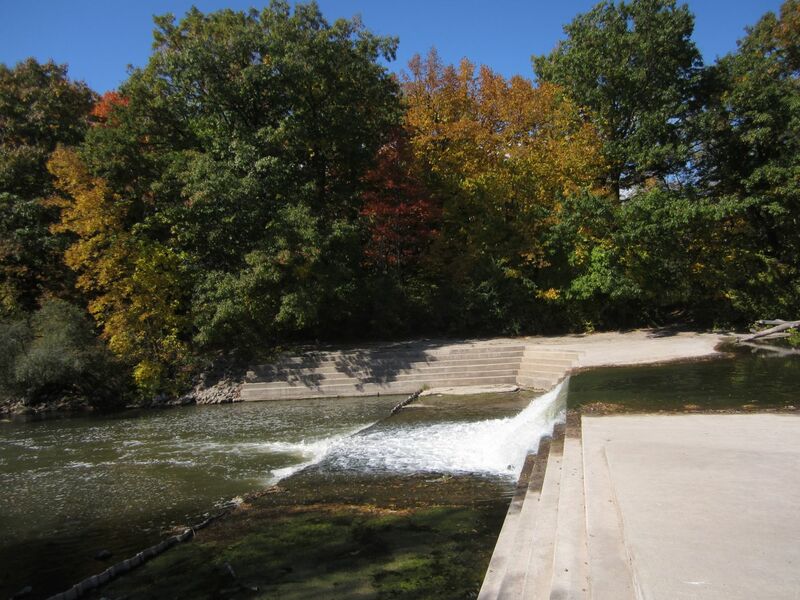 Fly fishermen are seen frequently in the shallows of the Sheboygan River, most notably at the thirteenth on the River, and fourteenth on the Meadow Valleys. Fly fishing seems unnecessary at this time of year, as a large net seems like it would work just as well. Then again, golfers don’t walk their ball to where they would want it to be and drop it there, only to then walk it to the next spot they would like to be at until they drop it by hand in to the cup. Similarly, fly fishing is a much more sporting challenge. The salmon are only part of the wildlife found at the River. 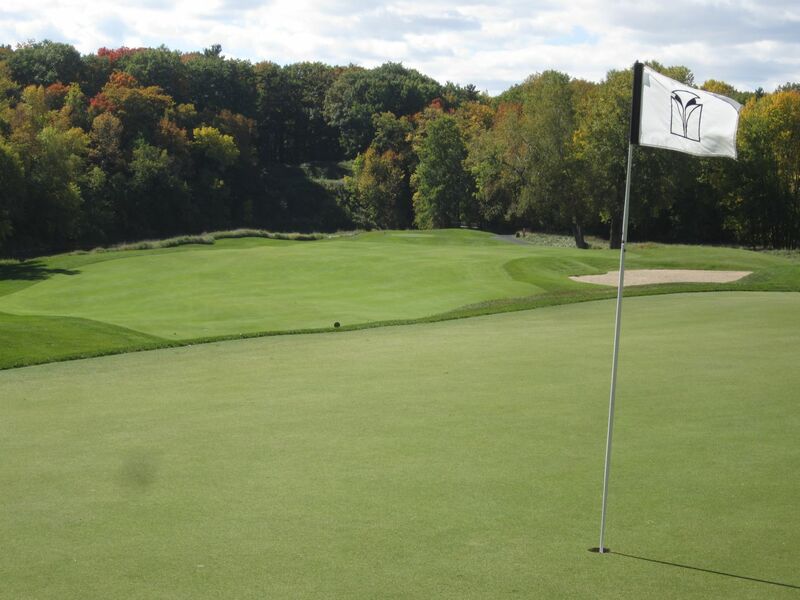 Three of its most renowned natural population include the two stately swans normally found on Swan Lake, and the red fox that traverses the fairways and clubhouse area surrounding the fourteenth hole. I am told the swans are currently relocated to the Meadow Valleys since the US Women’s Open, while the red fox is aging and often seems a bit out of sorts, but still visits the clubhouse area on occasion. 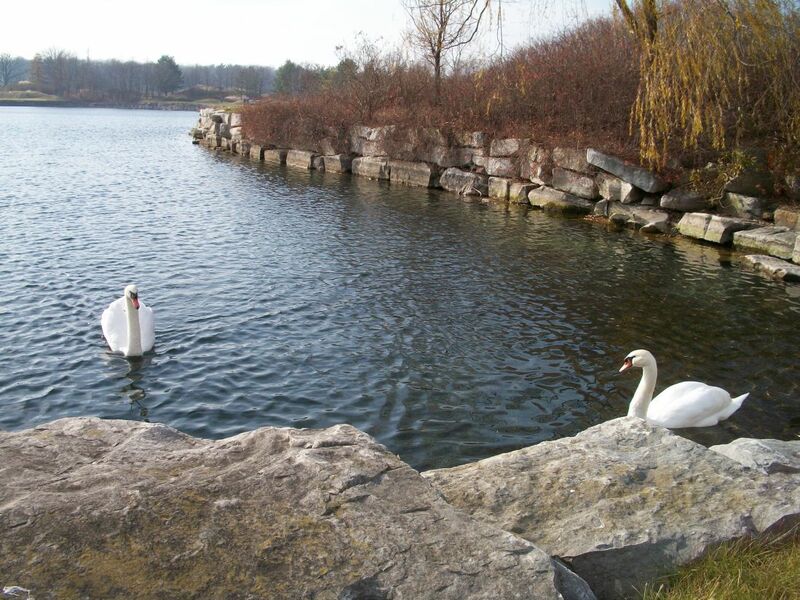 I was disappointed in July to attend the US Women’s Open and not see these majestic swans, especially since I told readers in my listing of the top ten par three holes in the state that I expected them to be featured predominantly prior to and following commercial breaks. They really are amazing to watch: When golfers are on the tee boxes, they swim near the tee boxes; when they go to the green, they swim near the green. They seem to be genuine golf enthusiasts. Fortunately, there is plenty of great golf to be found on the Meadow Valleys, too. A defining characteristic of Pete Dye’s courses is his way of forcing golfers to use every club in their bag, and every shape of shot. I have never seen this be more evident than it is at the River. Holes like nine, thirteen and seventeen oblige players to draw their tee shots from right to left – a skill that remains unrefined in my game. Towering trees on the ninth and twelfth leave little opportunity for other shot shapes, although they can be flown with a long and lofted tee shot on nine. Twelve is just next to impossible. At 7,404 yards from the championship tees (6,865 from the blues, 6,507 from the greens that we played, 6,110 from the whites, and 5,115 from the reds), the River course is long, too. 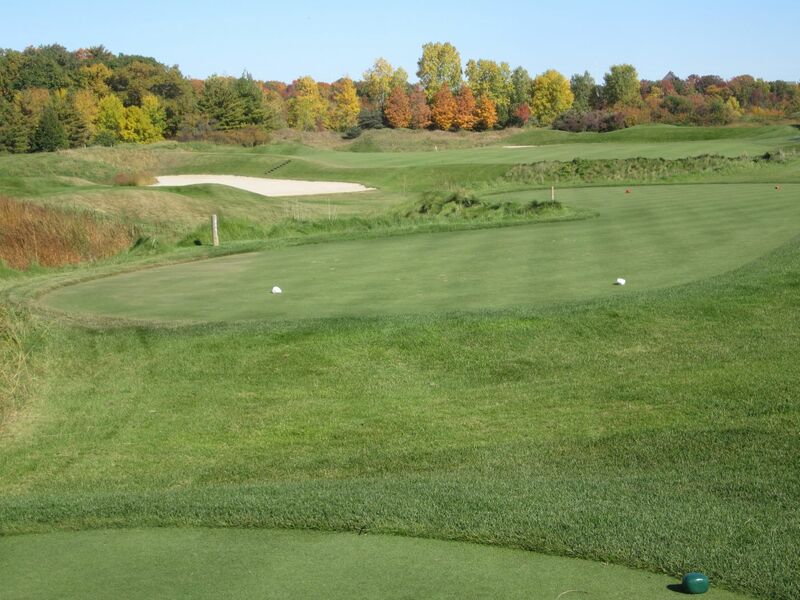 In fact, the Original Championship course at Blackwolf Run was set up for the 2012 US Women’s Open at 6,954 yards – the longest course ever played at sea level in the 60-year history of the event. The Andersen Consulting World Championships of Golf played in the mid-nineties played the Original Championship course at a considerably longer distance. As an aside, that event was last won here by my favorite PGA Tour golfer, Ernie Els, in 1997. But, I digress. 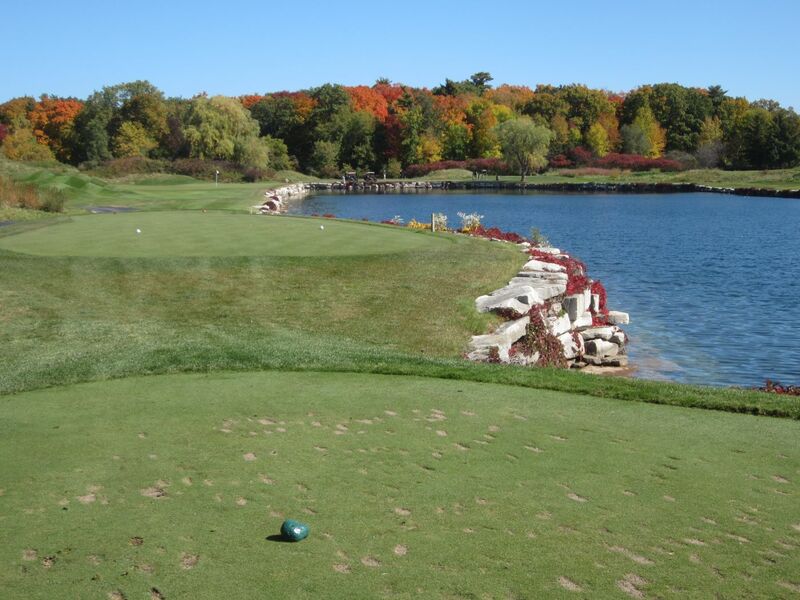 One of the most frequent discussions about the River is how it compares to the Straits course at Whistling Straits. 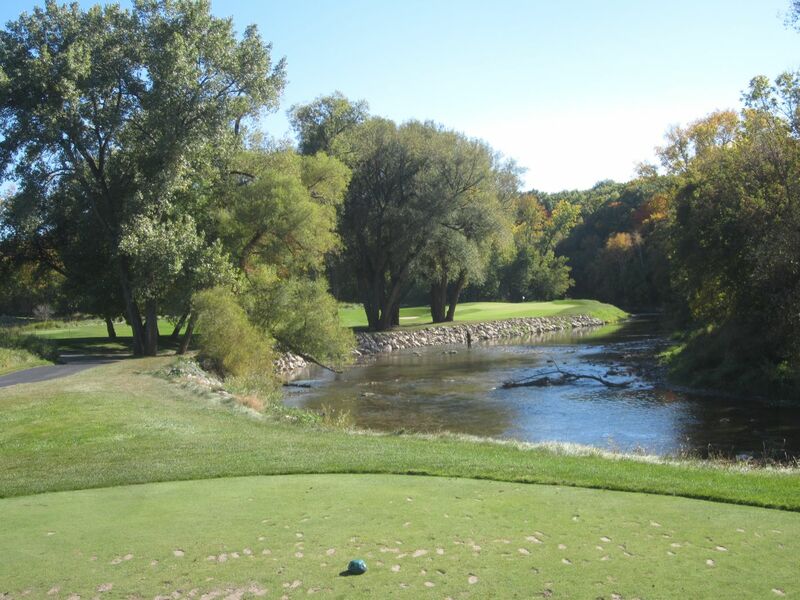 While the Straits’ splendor revolves primarily around Lake Michigan and the course’s rugged terrain, Blackwolf Run’s stunning beauty is found in the forests, river and wildlife that abounds. That being said, I have only seen parts of the Straits while there for PGA Championship events and playing the Irish course. 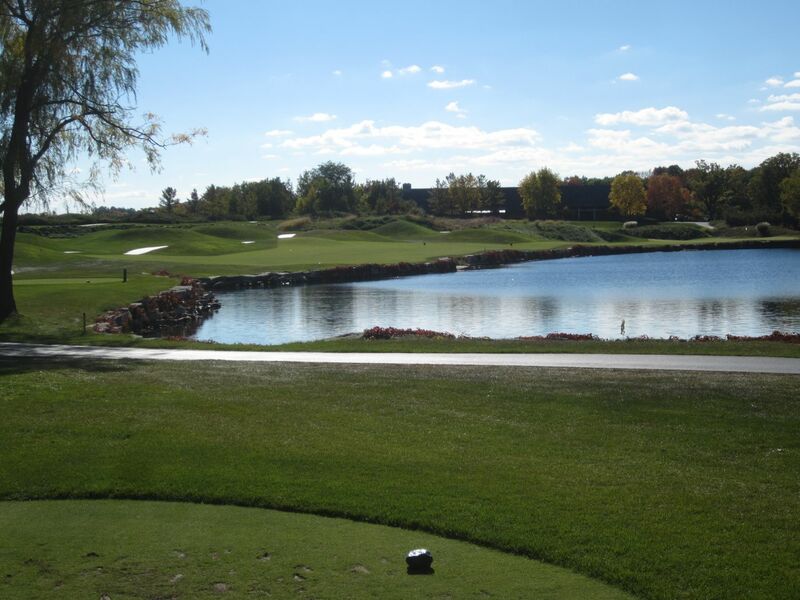 The River course is featured on both sides of the entranceway in to Blackwolf Run, and Swan Lake resides just outside the entrance to the clubhouse. The vines encumbering the rock walls that terrace this clear inland lake are now bright red and provide a pleasing contrast against the white stone, tall golden fescue, clear blue skies and water, and the green grasses and foliage. The clubhouse has old-world log cabin charm. The detail that goes in to Blackwolf Run makes it a truly special golf experience. 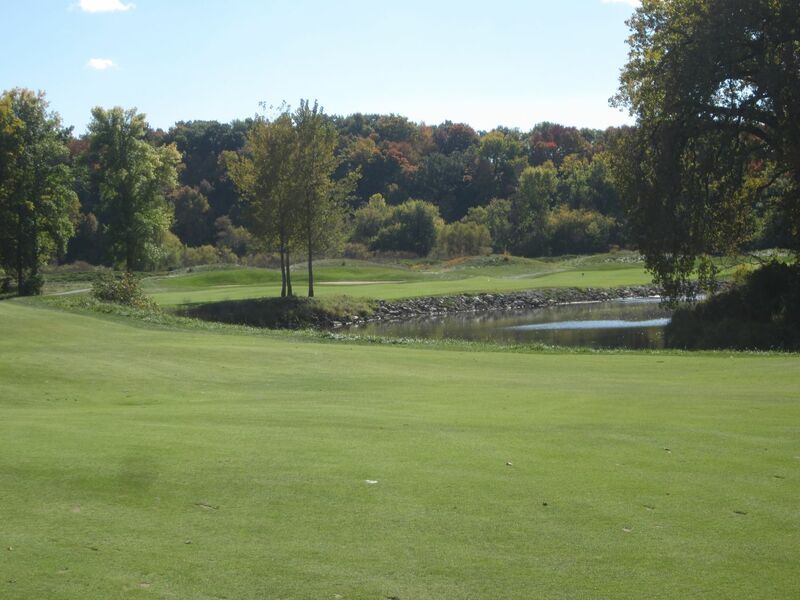 Left of Swan Lake from the clubhouse is Blackwolf Run’s practice facility, which features natural grass hitting stations and a chipping green with fairway approach areas and a deep sand trap. Even the chipping green rolls fast. It can be used accurately for putting, although there are obviously dents on the surface. 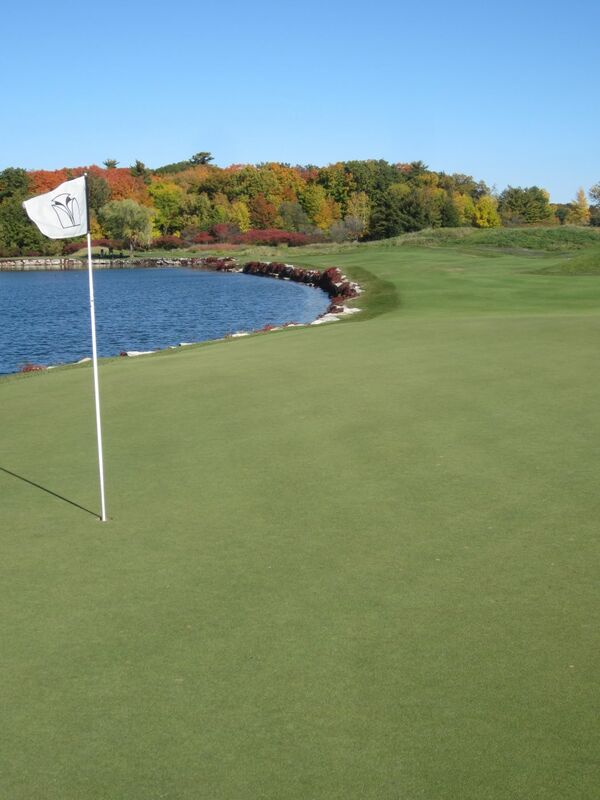 The putting practice green is on the opposite side of Swan Lake and allows for a smoother warm-up experience. On the way to the first hole of the River course you will pass by a very seldom used tee box. This is the tee box used for the first hole of the Original Championship course, and when used sets up one of the most demanding par four holes I have played. Outside of tournament times, though, it is unused and leads to the green of the ninth hole of the Meadow Valleys. 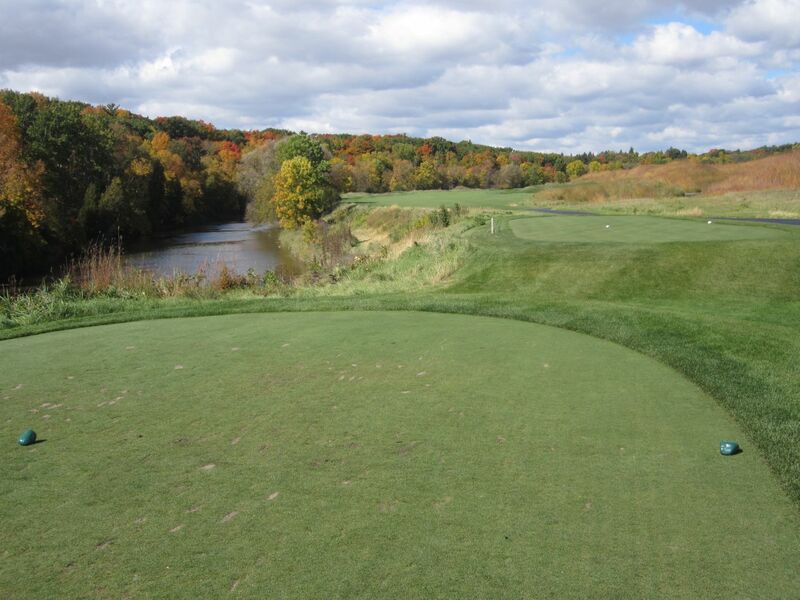 The first hole of the River course runs adjacent to the Sheboygan River on the left, and is heavily mounded on the right. 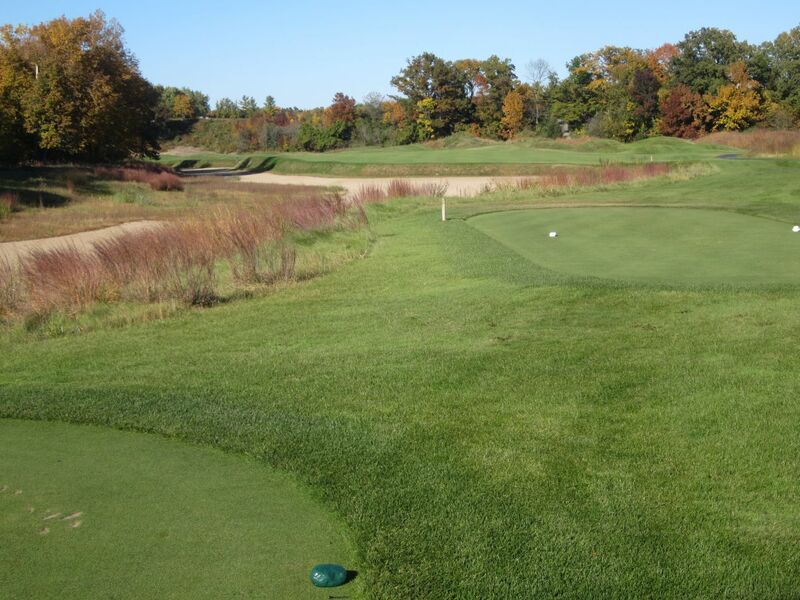 The tall fescue that lines the rough areas envelops anything errant – balls hit into it should not even be searched for. This opening hole is a medium-length par five from the green tees, at 526 yards, and can be hit in two with a couple of long shots. The green area is bunkered on the left and runs toward the river. Two is one of the narrowest holes on the River course, but is otherwise fairly straightforward. 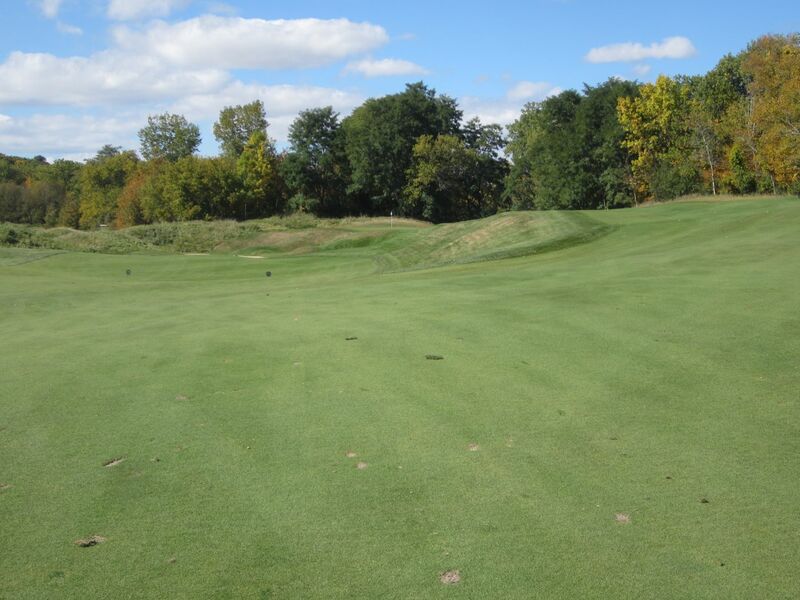 With woods lining the left side of the fairway and fescue to the right, a soft fade works nicely to set up a short iron in on this 355-yard par four. 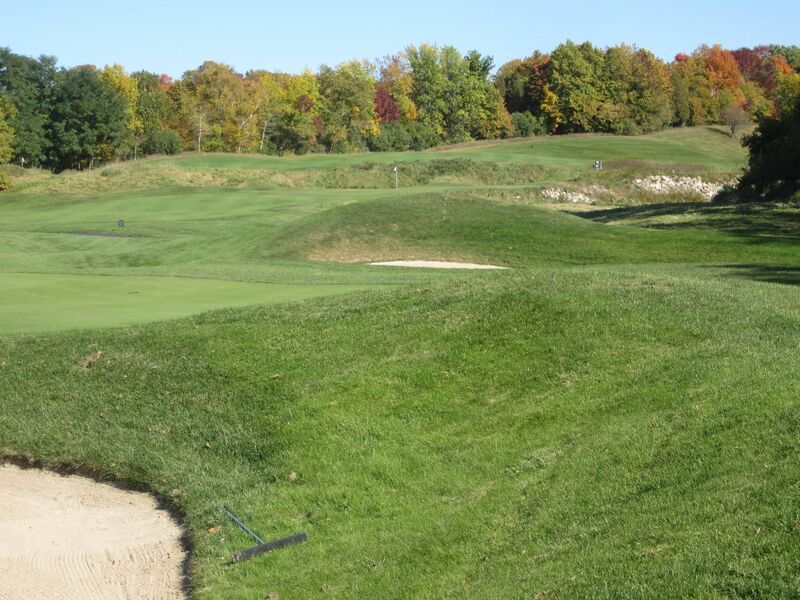 The approach area is crowded by five large sand traps, the two worst of which are found before the green. 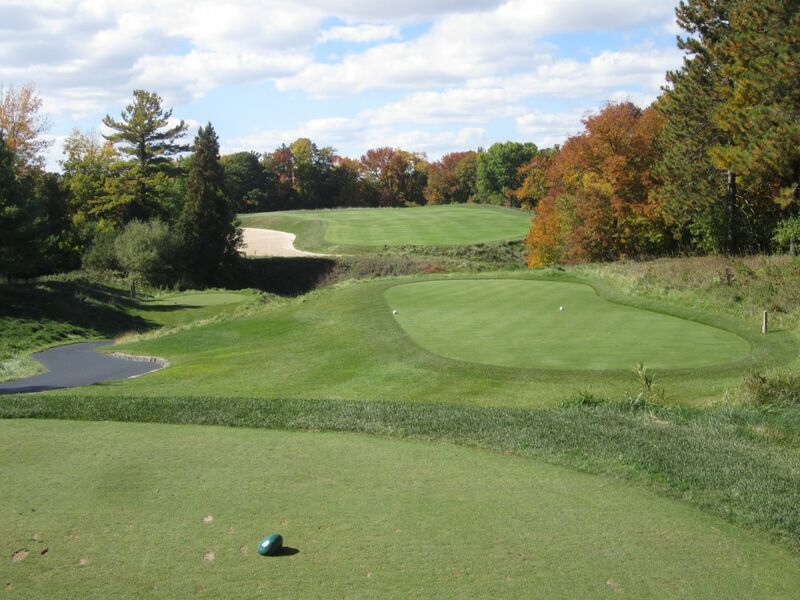 Three played as one of the most challenging holes on the course during July’s Women’s Open. A par four of about 400 yards, the opening to the right-side of the fairway seemingly drops off the face of the earth to a deep sand trap prior to the large tree found in that direction. I witnessed several women hitting this awful location while there for the final round, although at 185 yards from the green tees it did not come in to play for my friend, Mitch, or me. 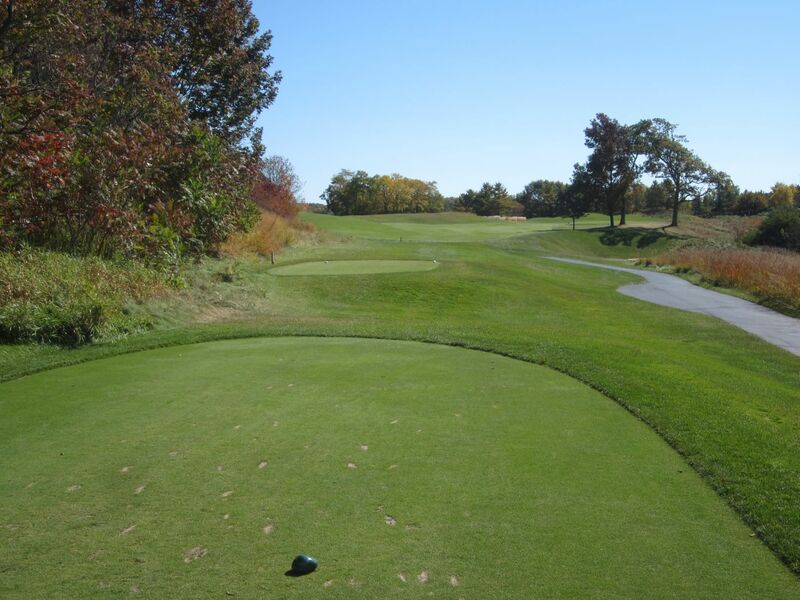 The fairway runs left to right, and tee shots favoring the right side will leave the shortest approach. A 150-yard long sand trap lines the right side of the hole, though, and should be avoided at all costs. Crossing the driveway of Blackwolf Run after the third hole brings in to view the magnificent Swan Lake and the fourth and fourteenth holes. 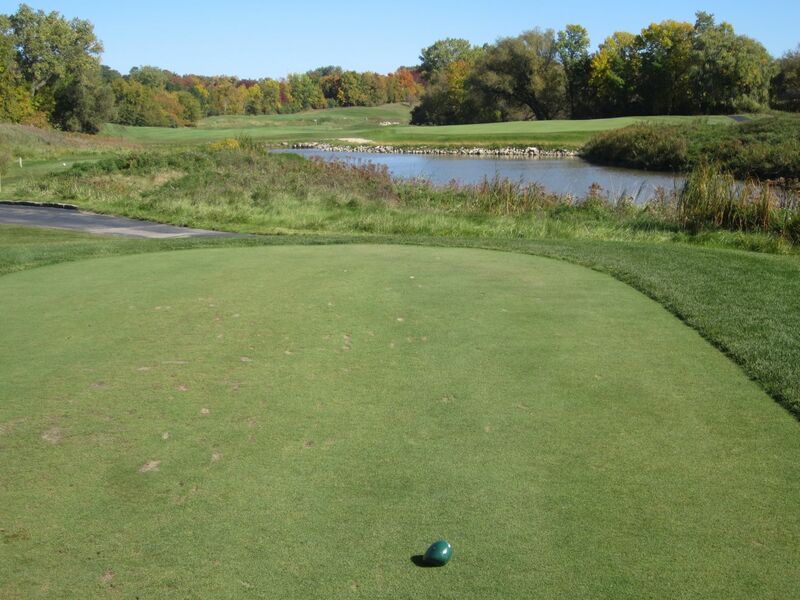 Four is one of the most harrowing par three tee shots found anywhere: Water runs the entire right side of the hole, and the green and approach area are narrow and abut the lake. It also doesn’t help that this hole is a healthy 185 yards from the green tees, but at least it’s not the 219 from the blacks. This was the most popular hole watched at this year’s Women’s Open. While four is a beautiful par three, five is a magnificent par four. 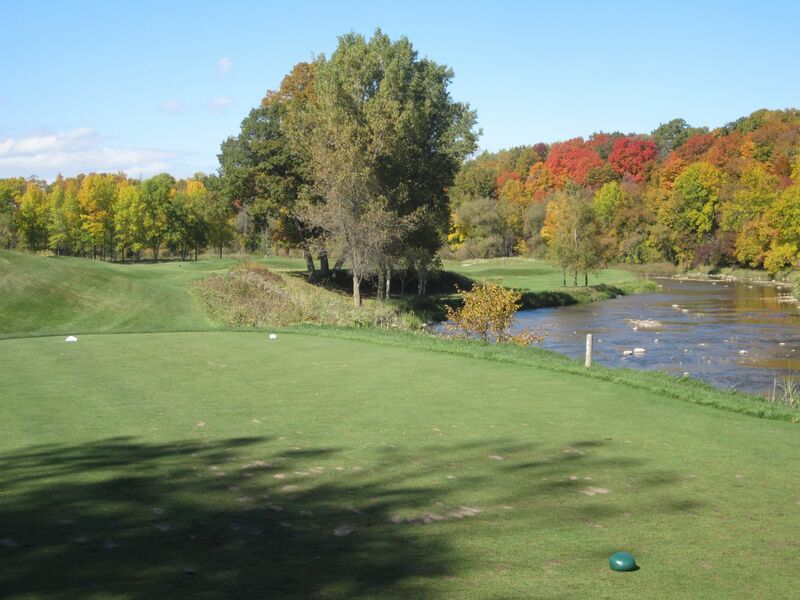 This is the first hole played on the River course that is not part of the Original Championship track – the Original Championship skips five through thirteen and instead rounds Swan Lake to fourteen as its fifth. Three times leading up to our round I was told about the tee shot on five, and it did not fail to impress! Six is a very deceiving tee shot. The hole layout looks to favor a drive to the left side of the fairway. Hitting one of my best baby fades of the day, I marked an “F” on my scorecard for fairway hit, then drove up the fairway only to find that the left side actually falls downhill and then left into a deep woods and ravine that leaves errant (even though I thought it was perfect) shots unfindable. Had I checked the yardage guide prior to this tee shot, I would have seen that the trees are just 238 yards from the green tees, and would have hit a three-wood or hybrid. I hope you will learn from my mistake. 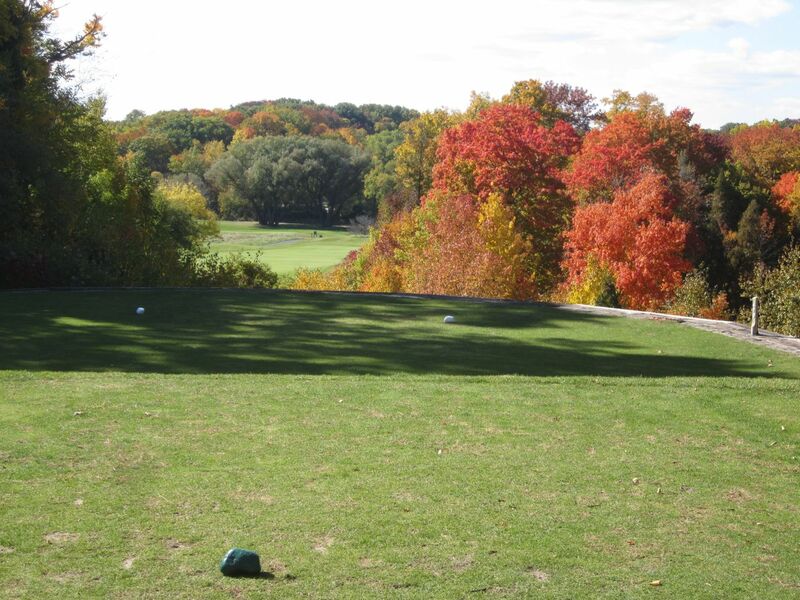 The seventh hole is another tee shot that is best attacked with less than driver. 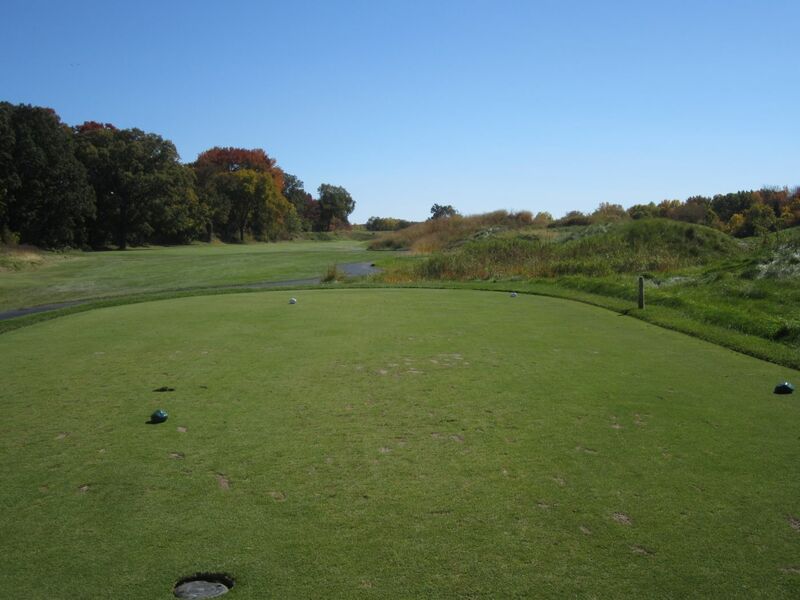 At just 374 yards from the green tees, a 225-yard shot to the middle of the fairway will allow a manageable play in, while hitting driver brings in to play out of bounds long and to the right, and a deep and expansive sand trap to the left. 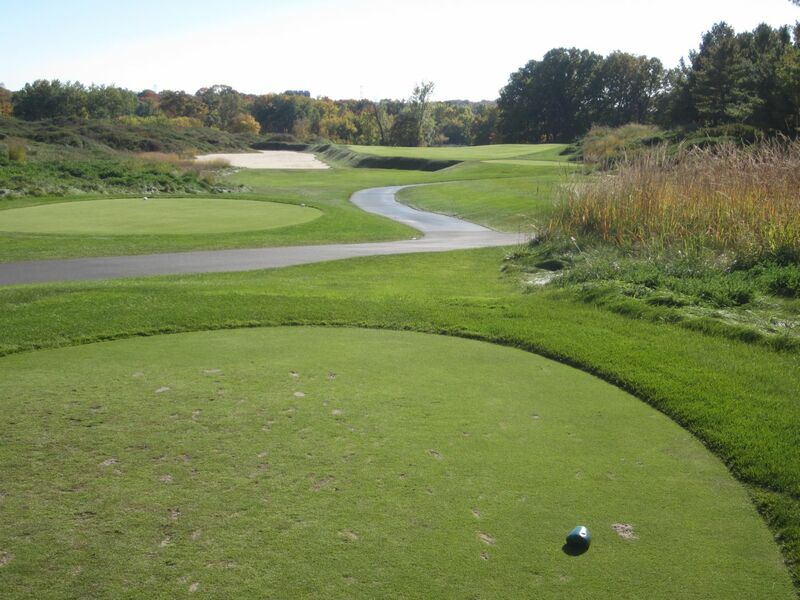 The sand trap runs to 247 yards from the green tee boxes, and leads to a vertical wall that rises about eight feet. If flown with driver, the narrow fairway area beyond it runs to two smaller sand traps. What I am implying here is that driver is again not the smartest play. 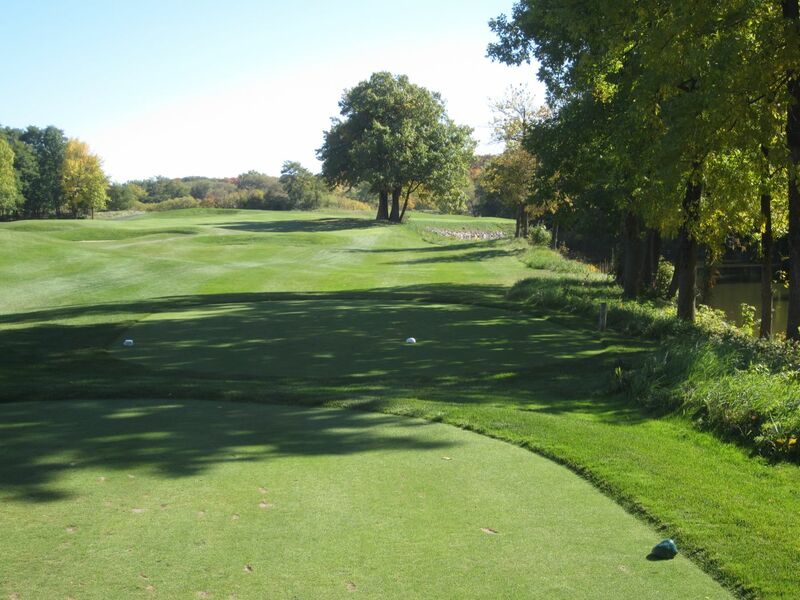 The eighth hole on the River course is nicknamed “Hell’s Gate.” With an elevated tee shot downhill and over trees, the fairway can handle a drive as long as 275 yards. Hit a gentle cut to make this allowable distance longer, but beware the sand traps and tall fescue that are found long. 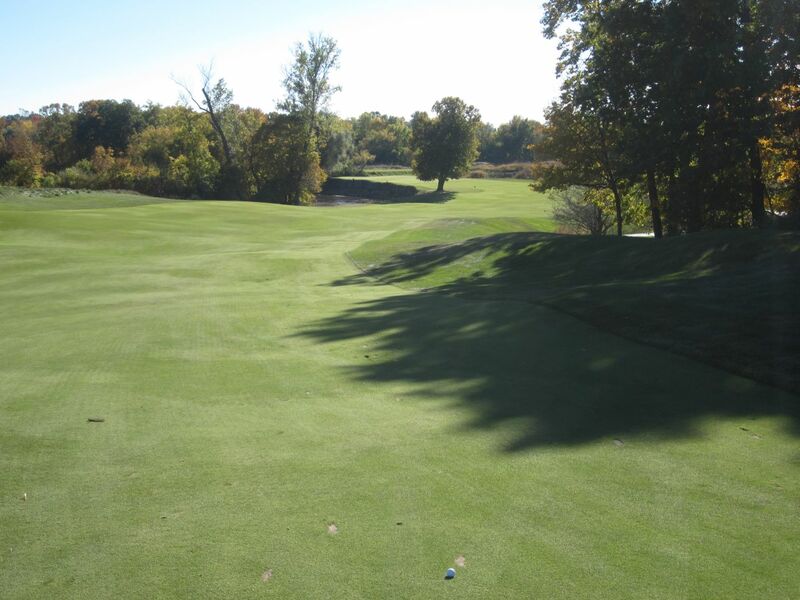 The fairway splits at around 150 yards out, and results in a higher and lower level. 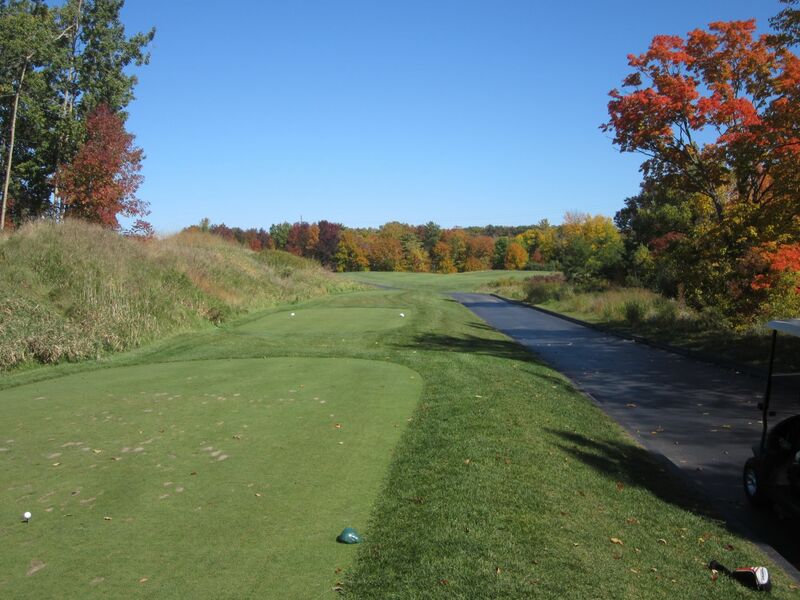 The higher level is narrow and is bordered by a drop-off to the river, while the lower level is less intimidating but leads to sand traps and a significantly uphill wedge shot. Nine is the River course’s exemplary risk/reward hole. A short par four, the green can be reached off the tee with a drive of 305 yards. The approach area is littered with deep bunkers, though, and the river borders the entire right side. Tall trees protect against straight drives, making the smart shot a long iron left of them. I lucked out with a four-hybrid over these trees, finding the fairway prior to the central pot bunker and an approach of just 85 yards in. I tried to get a little too cute with the wedge, though, and shaved under the ball en route to yet another five. 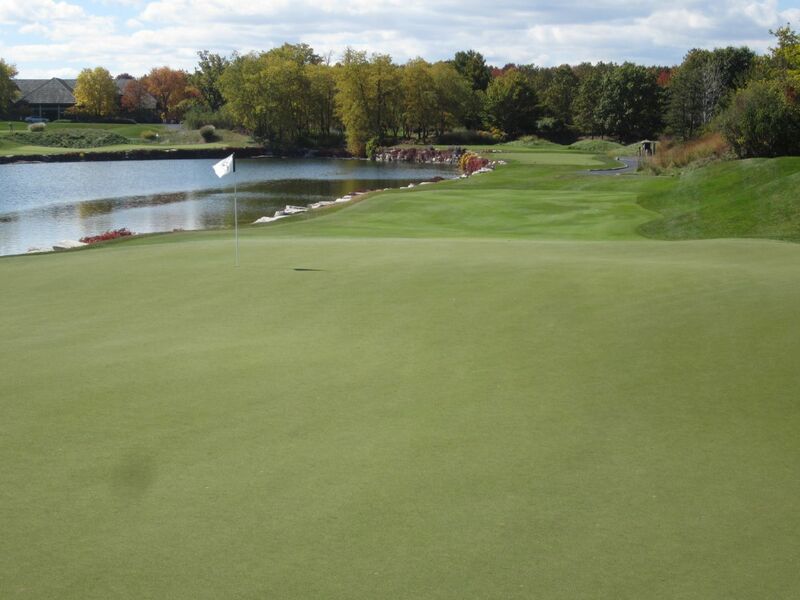 With a front-right pin location, the green slopes heavily from front to back, and towards the river. To me, the eleventh is the most scenic hole on the River course, which is an awfully bold statement. I am told that it is Herb Kohler’s favorite, as well. 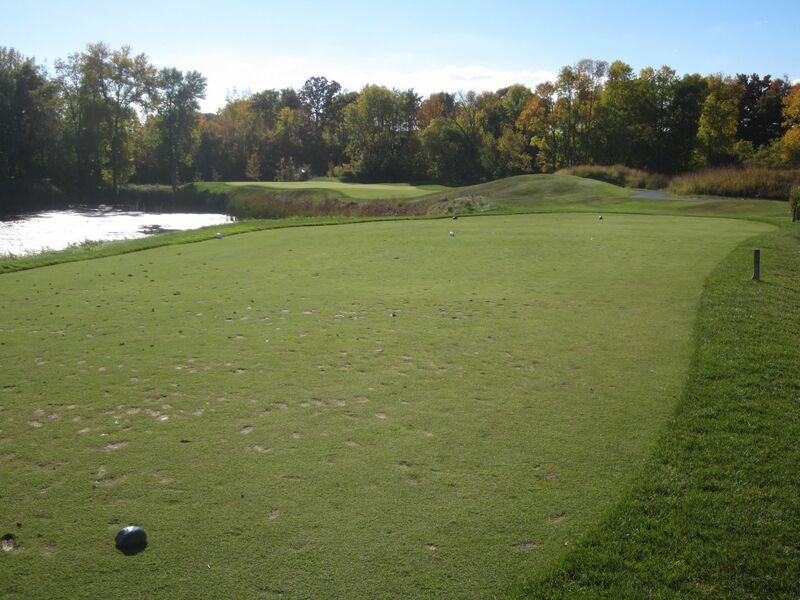 The twelfth hole tee shot plays over water, and requires 203 yards from the green tees to carry the pond and long sand trap found beyond it. 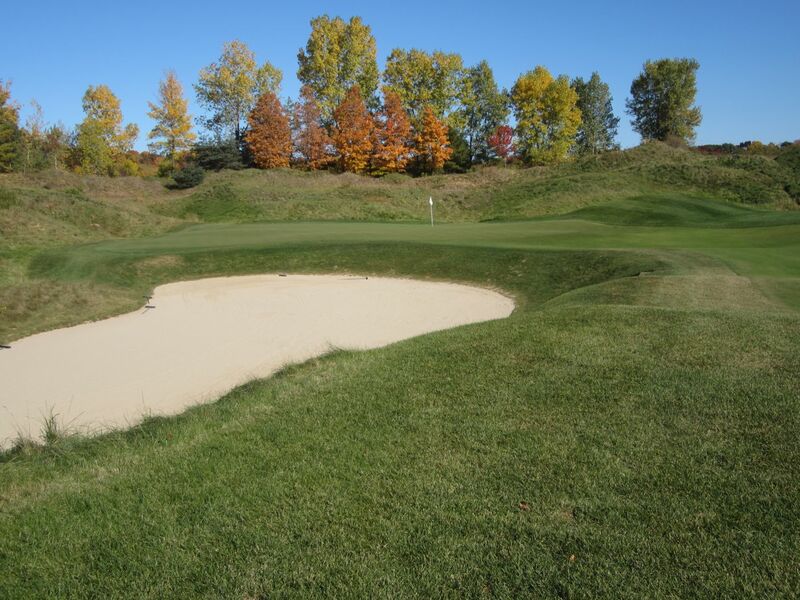 Two centrally placed bunkers are in the middle of the fairway, and proved to be easily hit. Long hitters can aim for the left side of the fairway, requiring about 230 yards of carry but resulting in a much shorter approach. Thirteen is possibly the hardest par three I have ever played. 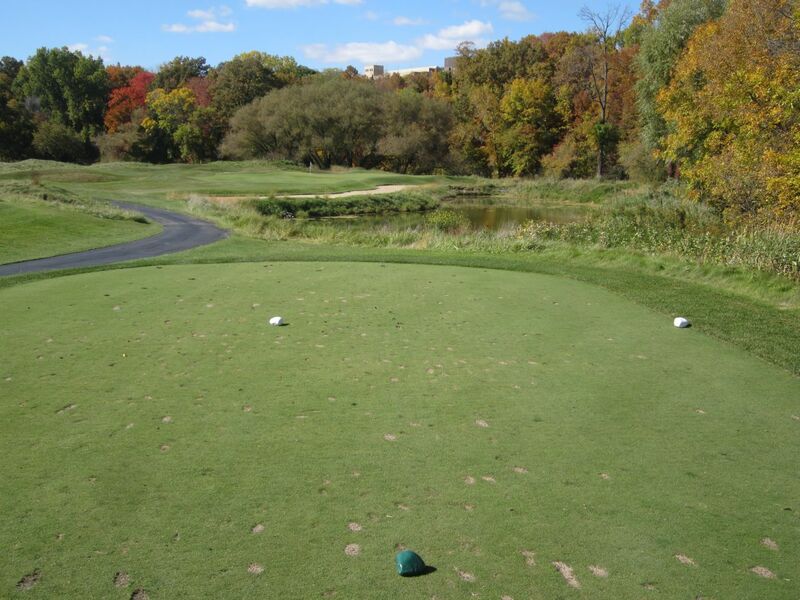 At 192 yards from the green tees, the wind played toward the Sheboygan River and left no room for error. The hole’s layout and the tall timbers for which the hole is named made a right-to-left shot necessary, as the trees are too tall and far away to carry with a long iron. I was warned of that earlier by the starter, Tim, but found out for myself when I had very little confidence in my draw. Adding to the degree of difficulty was a fly fisherman in the shallows of the river, directly in line with my tee shot and the green. 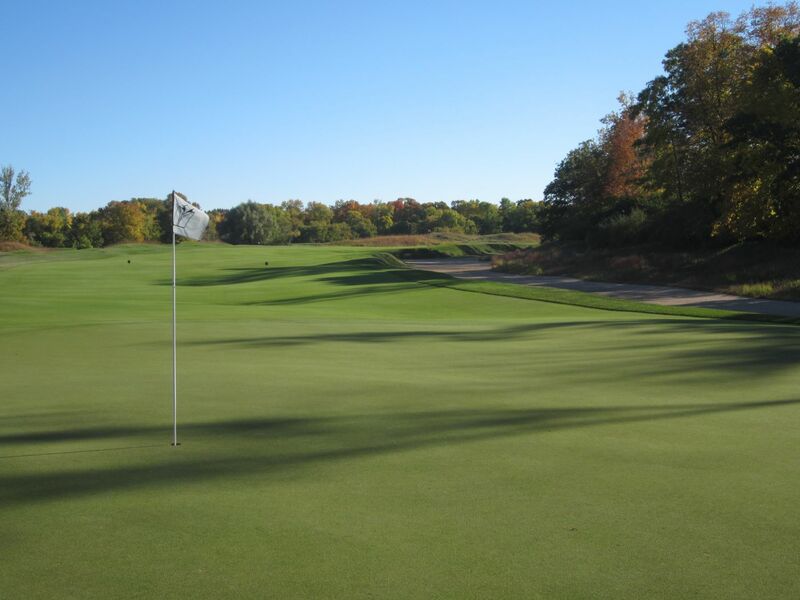 Fifteen is aptly named “The Sand Pit.” One of the largest sand traps outside of the Meadow Valleys course awaits anything hit left under 250 yards, while another trap is found on the right at 228. 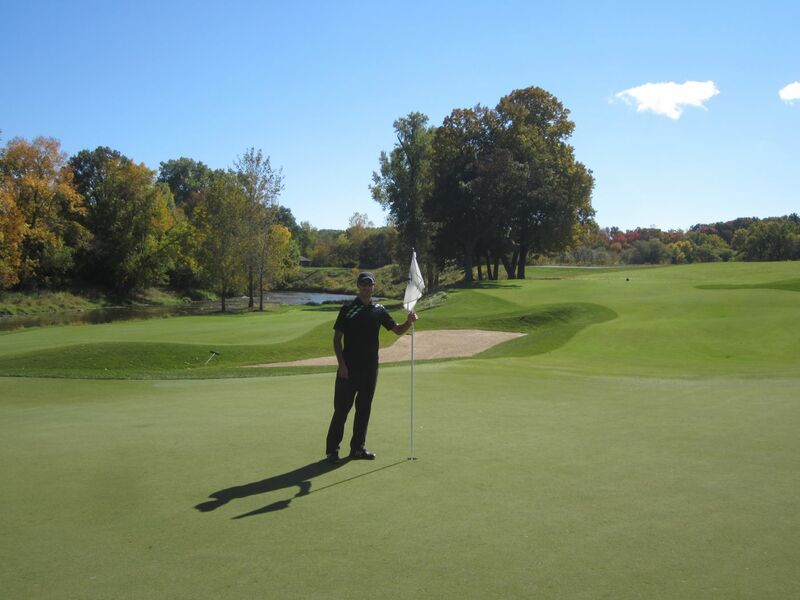 The green is found in a valley twenty feet below the fairway, and is fronted by another, almost as deep greenside bunker that lies far beneath the putting surface. “Unter der Linden,” or under the Linden, is the moniker for the sixteenth hole on the River course. 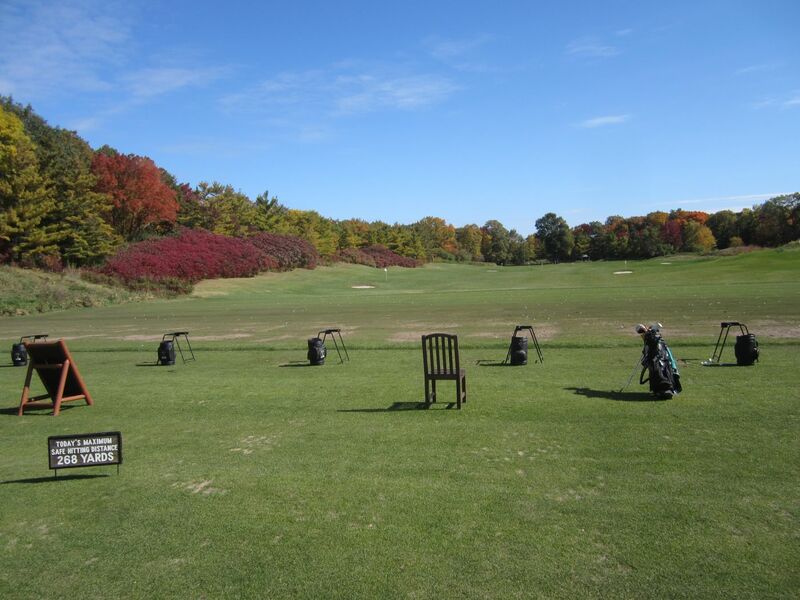 A left-to-right tee shot can be played long, and will roll downhill and toward the right side of the fairway. 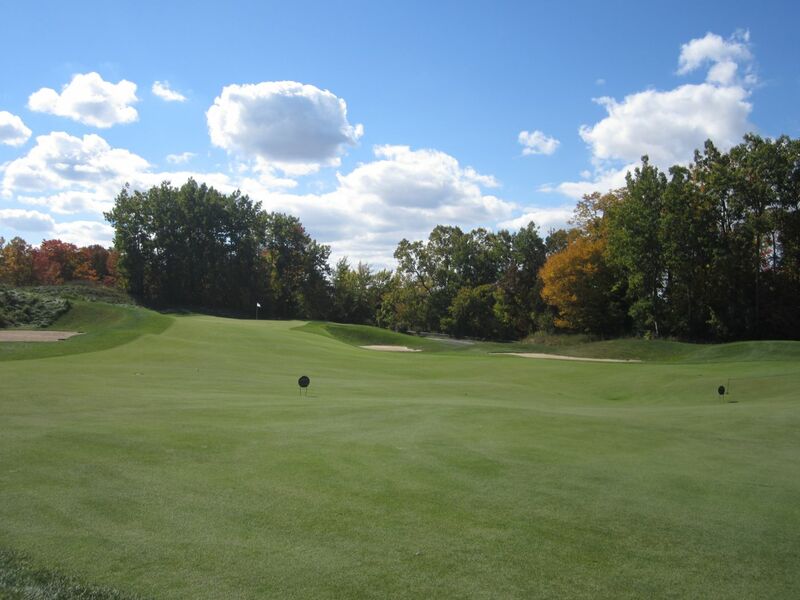 The second shot needs to be strategic to allow for an approach either to the left, over, or to the right of the statuesque Linden tree that guards the green from easy approaches. The left side of the green plays all the way up to a wall that drops fifteen feet straight down to the river. At the US Women’s Open, I was watching the action on the par three seventeenth when Lexi Thompson hit a tee shot to the upper-right side fringe. Her playing partner then hit the water, forcing her to use the drop zone, which was on the right side of the tee box – not much relief, huh? Lexi walked over by me, and I said “Nice shot, Lexi.” She turned around and looked me in the eyes, smiled and said thank you, to which I replied, “You’re, uh, um, you’re welcome, Lexi.” Then I felt like a creepy old guy. After playing this hole, though, I can say with certainty that her shot was awfully impressive! Sure, it looks great from the tee, but the seventeenth forces another drawn tee shot that is very difficult to hold. Right of the green is playable, although polluted with deep swales that will require a flop shot to get to the green. 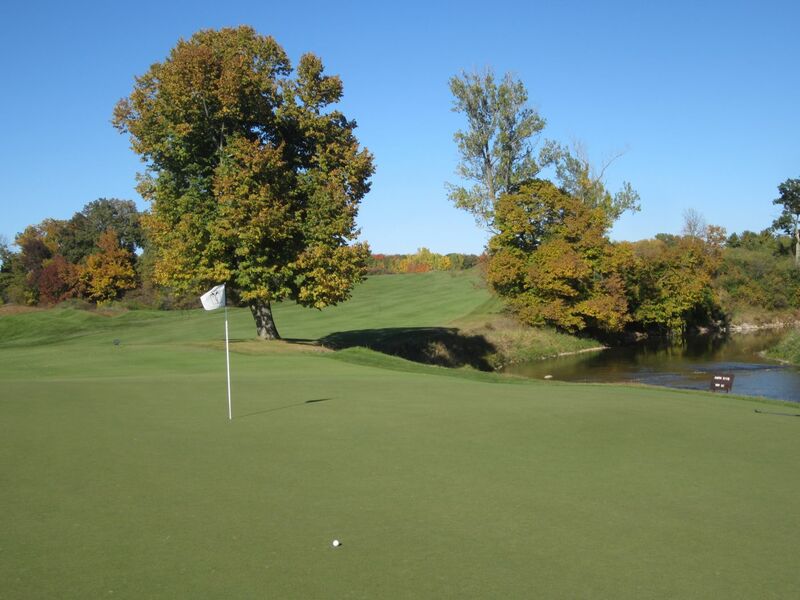 The back of the green drops off to a narrow playable area that is six feet below the green’s surface, and the left side or short leads to lost balls in the pond that makes up the entire approach zone of this scenic par three.